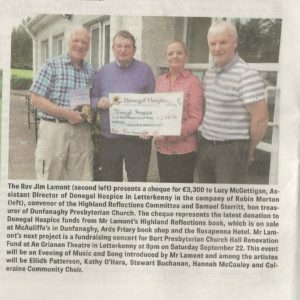 As some of you may have seen from the photograph published in the Donegal News this week, a cheque for €3,300 has been presented to Donegal Hospice by the Rev Jim Lamont, former minister of Dunfanaghy and Carrigart, This was the la test donation to Donegal Hospice funds from Mr Lamont’s Highland Reflections book, which was supported by both congregations. It brings to over €100,000 the amount raised for Donegal Hospice by Mr Lamont’s two books. Sam Sterritt, the treasurer of Dunfanaghy Presbyterian Church, was involved in the ceremony. Thanks are expressed by the Highland Reflections Committee to the members and supporters of both congregations for their continuing interest in the book, which is still on sale in local bookshops. In a separate venture Mr Lamont, who is currently Vacancy Convenor at Burt and Inch Churches, is organising a fundraising concert for Burt Presbyterian Church Hall Renovation Fund at An Grianan Theatre in Letterkenny at 8pm on Saturday September 22. This event will be an Evening of Music and Song introduced by Mr Lamont and among the artistes will be Eilidh Patterson, Kathy O’Hara, Stewart Buchanan, Hannah McCauley and Coleraine Community Choir. Tickets are on sale online at An Grianan.